Just hours after Netanyahu dubbed Erdogan 'anti-Semitic dictator, President Trump says Turkish leader the right man for the job in Syria. 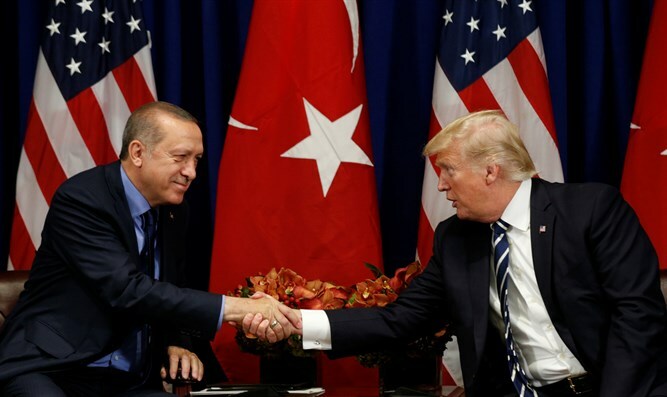 Turkey will fill the void left in Syria by America’s impending departure, President Donald Trump announced Monday morning, praising Turkish President Recep Tayyip Erdogan after a discussion with Erdogan on the future fight against ISIS in the war-torn country. On Sunday night, a US defense official told CNN that the president had signed an order to begin the withdrawal of American forces deployed to Syria. The US currently has roughly 2,000 soldiers in Syria – mostly in the northeast – as part of the ongoing campaign against the ISIS terror organization. The controversial decision was followed by the resignation of Mattis and of Brett McGurk, Trump’s special envoy for the global coalition to counter ISIS. It was later reported that President Trump spoke with Erdogan, and that he told the Turkish president that the situation in Syria was “all yours. We are done.” Erdogan reportedly promised to finish off ISIS. President Trump later confirmed the conversation with Erdogan, saying he had a “long and productive call” with Erdogan. On Monday, the president praised the Turkish leader as “a man who can” defeat ISIS. The decision comes just hours after Israeli Prime Minister Binyamin Netanyahu accused Erdogan of being an “anti-Semitic dictator”, the latest in a series of jabs between the two leaders.